Do you have questions about EMV? Now that the EMV liability shift is in effect, we want to make sure that you have upgraded your credit card processing equipment so that you can accept EMV chip cards. Learn what this means for your business and how you can get best prepared. EMV credit card processing is a fraud-reducing chip technology that can help protect businesses and consumers against losses from the use of counterfeit, lost and stolen credit and debit cards at the point-of-sale. EMV chip technology is becoming the global standard for credit card and debit card payments. EMV was named after its original developers (Europay, MasterCard® and Visa®). Prior to October 1, 2015, a cardholder's information was stored on a magnetic stripe found on the back of the card. With EMV credit card processing technology, cardholder information is stored in a chip that is embedded in the card. Rather than swiping a card at the point-of-sale, customers will insert their card into the terminal and a unique, one-time-use code will be used for that transaction. Cards are embedded with a chip that is encrypted with data. EMV credit card processing devices have the ability to read data stored on a chip within the card itself. During the authorization process, cryptographic functions validate the authenticity of the card and cardholder. Prior to October 1, 2015, when an in-store transaction was conducted using a counterfeit, stolen or compromised card, the card issuer was responsible for the losses. On October 1st, the responsibility shifted to the party that is the least EMV-compliant in the fraudulent charge. As a merchant, this means you could now be responsible for the fraudulent charge. It is in your best interest to make sure that your business is EMV compliant to eliminate any liability that may come from a fraudulent charge. We offer EMV pin pads and countertop solutions. Our solutions are EMV and NFC capable. 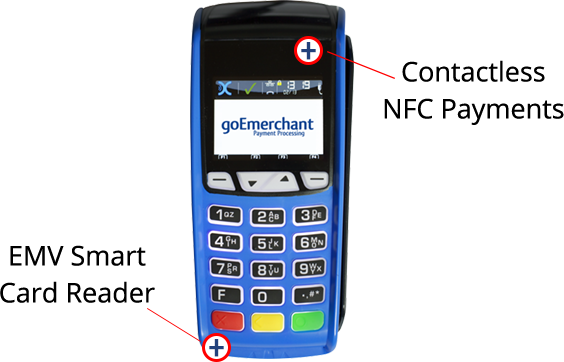 goEmerchant has over 20 years' experience in delivering payment processing solutions to help grow your business and is the ideal partner to help you during this transition to EMV credit card processing. The future of credit card processing is here. Xion® terminals accept card swipe and the most recent payment technology including Apple PayTM, Samsung PayTM, Android PayTM and EMV transactions through the terminal or a secure, customer-facing PIN pad. The Xion is an advanced terminal that features top-of-the line PCI PED 3.0 security and is available to connect with either IP or dial-up connection. Whether your customers are paying with credit, debit, EBT, Apple Pay, Android Pay or EMV you'll be able to take their payment. Enjoy the highest levels of security including EMV, PCI and PED 3.0 approval. Our toll-free customer service is available 24x7x365. You are always able to speak to U.S. based representative who can help answer any questions or any issues regarding EMV credit card processing. The iPP 320 optimizes countertop retail checkout with a fast, secure EMV payment solution. It enables retailers to accept credit and debit card electronic payment transactions that require EMV. 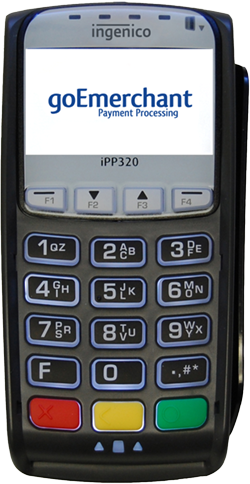 The iPP 320 is easily connected to cash registers and collection systems, and accept NFC/Contactless payments. The iPP 320 meets the latest hardware and software security requirements. The iPP 320 ensures secure data and application management and enable highly secured electronic transactions. In addition to accepting EMV, magstripe and NFC/contactless payment, the iPP 320 also supports new technologies such as NFC loyalty, couponing, wallets and QR codes. The iSC Touch 250 combines EMV credit card processing, signature capture and touchscreen technologies in a robust, compact design. This EMV device showcases a full range of revenue-producing promotions - ads, videos, couponing, targeted up-selling and cross-selling opportunities, gift card sales, extended warranties, digital signage, and more. The iSC Touch 250 meets the industry's highest and newest hardware and software security requirements and is PCI PTS 3.x & 4.x certified. It complies with SRED and Open protocol modules, and supports all end-to-end encryption (E2EE) solutions for reduced PCI DSS scope. 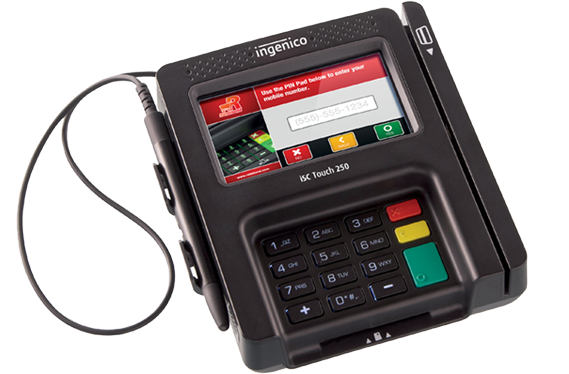 The iSC Touch 250 accommodates all forms of payment including EMV chip & sign, magstripe, signature capture, and NFC/contactless. It also supports new options such as NFC loyalty, couponing, wallets and QR codes. The optimized glass display on the iSC Touch 250 reduces reflectivity and assures oustanding readability even in poor lighting. On the iSC Touch 250, the keypad is large, backlit and ADA-compliant. The fast processor guarantees instant, accurate transactions. Looking for more information on EMV?